VhostWeb Review 2019: Is VhostWeb a Good Hosting? VhostWeb is a Thai web hosting provider. A small subsidiary company of the Clicksee Network, they offer a broad range of hosting solutions suitable for beginners all the way to large corporations. VhostWeb is a Thai company touting themselves as a one-stop web hosting provider. They have hosting solutions for a wide range of clientele, from complete newbies who only want a simple website to large corporations in search of enterprise-grade solutions. They’ve been in operation since 1999 and currently host over a thousand clients on their servers. This package is definitely a nice option for those just starting out with website building, given that it comes with support for multiple scripting languages (PHP 5.3 – 7.0, Tomcat JSP, Python) and unlimited databases. This means you’ll be able to install loads of scripts to add functionality to your website without worrying about hitting the database limit. The free daily backups were also a nice touch, particularly for those planning on using WordPress. VhostWeb favors Plesk Onyx over cPanel for their shared servers. For those new to Plesk, this lightweight and mobile-friendly option is far more flexible as a control panel compared to the resource-hungry cPanel. Not only can you install it on both Linux and Windows operating systems, but with Plesk Onyx it’s easy to configure role-based access across multiple devices. If you’ve installed WordPress on your website, you also have an advantage as Plesk automatically updates its WordPress toolkit with new features on a regular basis. If you outgrow their shared servers, you also have the option of their VPS and dedicated server solutions. VhostWeb guarantees 99.9% uptime and offers SSL certification in all their packages. I found VhostWeb’s packages a little more expensive than the market average, especially considering that they’re primarily marketing to a Thai audience. Even so, they’re still in the affordable range. Their Linux shared hosting packages are cheaper than their Windows packages, which is understandable considering the difference in cost for the two operating systems. If you’re a beginner looking for a budget-friendly solution, I’d recommend you opt for their Linux packages – you likely won’t need the Microsoft-specific features. Do note that none of their shared hosting packages seem to include a free domain registration, so the cost of this will have to be factored into your calculations. Additionally, they don’t appear to have a money back guarantee or any free trials of their plans. Support-wise, you can reach them via their Zendesk live chat, a Thai telephone number, fax, or tickets. They also have a decently-populated knowledge base that may answer some of your queries. VhostWeb is a Thai company targeting locals, so bear in mind that you’ll have to be able to communicate in Thai to speak with their support team. This small but not-to-be-overlooked Thai hosting provider offers solid features in their packages. Given their parent company’s wide-reaching network, you can rest assured that they have the infrastructure to back up their services. 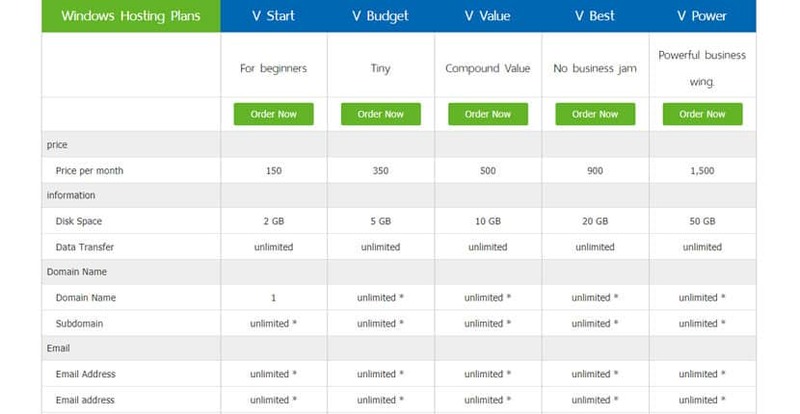 Wondering how VhostWeb stacks up against other Web Hosting companies? Enter any other Web Hosting company and we will give you a side-by-side comparison.